During the first few weeks of losing weight, a quick drop in pounds is normal. When calories from food are reduced, the body gets the energy necessary by releasing its stores of glycogen (a type of carbohydrate found in the muscles and liver). Glycogen naturally holds onto water, so when your glycogen stores are burned for energy, water is also released — about 4g of water for every 1g of glycogen — often resulting in substantial body weight loss that's mostly water. Either way I am quite happy with the start it gives you a boost immediately when you begin setting yourself up for a long road ahead. I have exactly 28 pounds to lose before the 1st of May, a goal I am confident of reaching. Just to give you an indication of what my diet (below) is like and a typical day on Weight Watchers for me. First off due to my height and current weight I get quite a large Pro Points allowance getting a 57 points a day which equates to 2280 calories a day ( 1 point roughly equals 40 calories ). You also get an allowance of 49 points extra to eat throughout the week, I tend personally to steer clear of this allowance as I don't make use of it, and I also do not use activity points. Before I start its worth stating you must drink I think 8 glasses of water a day but I drink water from the minute I wake up till I go to bed, it keeps you full for longer and aids digestion. 1 tortilla filled with 100g of lean ham, lettuce, onions and peppers. 1 orange - I am currently eating the gorgeous Ripoll oranges check them out here. Large serving of Joanne's stew which contains no fat or oil using very lean beef. 2 pink and white wafers - these are great when on a diet as they are only 40 calories / 1 point per wafer. All of the above equates to my daily allowance of 57 points. When I get to my desired weight that will go down a bit but right now I am not hungry one bit. 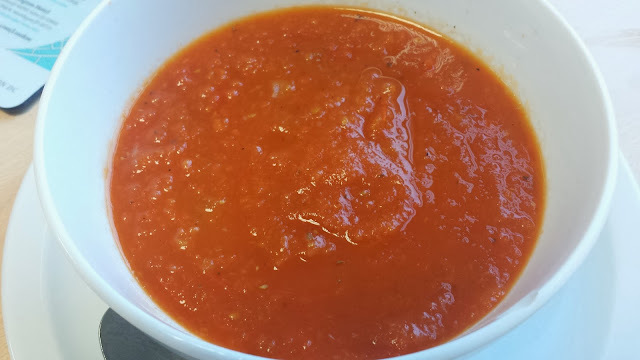 Now for my tomato soup recipe its quite simple yet tasty and contains very little calories. 4 celery stalks , cleaned and peeled of stringy outside. 2 large carrots, washed and peeled. 1) Roughly chop all the vegetable and fry for 3 minutes on a medium heat. 2) Add a crumbled stock cube, tomato puree, oregano and can of tomatoes, giving a mix. 3) Add 200ml of water and season bringing to the boil. Once at the boil reduce to a simmer for 45 minutes. 4) Blend and season, serve. If you are doing Weight Watchers let me know I would love to hear about it. Finally before I go here is an excellent site by Skinny Doll, it details her weight loss journey and is a fantastic resource for Weight Watchers as she pointed so much. Thanks for reading my ramblings as always.